“I wish someone had told me this when I was your age…” This is the good old prelude that everyone 14 through 25 hears enough to feel indifferent. Fortunately, I am discovering that the information that follows this introduction can be extremely valid. For example, the advice about resumes that my boss has been sharing with me and my co-interns has opened our eyes to the purpose of a resume, and how to use one properly. The advice he has given us so far is written below. 1) Your resume won’t get you hired. What it will do, though, is get you through the door. Very few people have been hired based on words written on one sheet of paper. The goal of the resume is to do one thing: to pique the interest of the prospective employer and to bring you to the next step, which is the interview. 2) Looks matter. Your resume must be esthetically appealing, as humans are apt to pay more attention to things that are appealing to the eye. This doesn’t make the prospective employer shallow. What it does mean, is that they are serious about who they want to hire. A visually appealing resume shows them that you care, you pay attention to detail, you care about your brand, and want to give off the best possible impression to those around you. 3) Tell a story. Humans like to be walked through information in an eloquent yet concise manner. 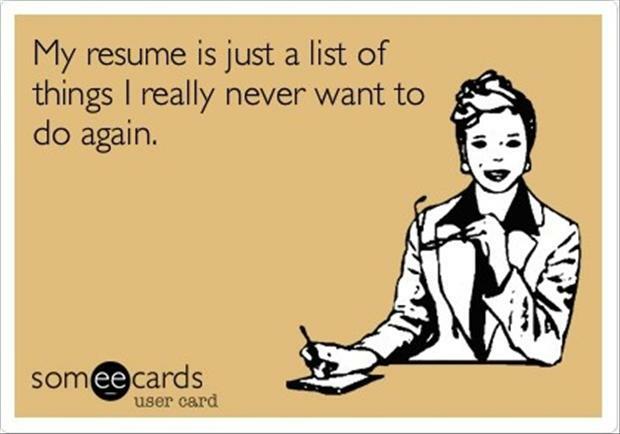 Your resume shouldn’t solely explain what you did in your previous positions. It should explain how you impacted the company’s business, how you helped them reach their goals (mission statement, yearly goals, ROI, etc. ), and, most importantly, what you did differently to make your time there matter. Examples and numbers are effective ways to show evidence of this. 4) Don’t just apply. It’s important that you don’t send along the same version of your resume to a bunch of companies. Tailoring your resume for a specific position will give you a leg up on the competition. It will help you learn more about the position you are applying for, and show the prospective employer that you understand what the company is looking for and that you hold the characteristics they are looking to attain in an employee. At the end of the day, most people don’t land positions because of their resumes. Nevertheless, every bit of effort helps. Also, often it’s worth absorbing advice given by elders – even if they start it with a cliché lead. Good luck & resume on!